Upon arrival at Chennai International Airport, meet Incredible India Tour representative for assisted transfer to the hotel. This is a capital of Tamil Nadu, bustling with its cosmopolitan charm and is known for its range of temples. Overnight in Chennai. In the morning, take a half day tour of Chennai with a visit to The Santhome Cathedral Church, a heritage Roman Catholic Church near Kapaleeshwarar temple is said to enshrine the mortal remains of St. Thomas the Apostle. He was one of the twelve apostles sent directly by Jesus Christ himself. This is one of the major pilgrimage sites for Christian followers. St Thomas Mount is the place where the apostle is said to have been killed. At Little Mount Shrine St. Thomas is believed to have lived in a tiny cave when he came to India around 58 A.D. Known locally as Chinnamalai, this cave is entered via the Portuguese Church that was built in 1551. Next in the series is a visit to the Fort St George. Built in the 1640 A.D., this was the first bastion of British power of India. The fort at present has undergone much alteration and now is used by the Tamil Nadu Legislative Assembly and the Secretariat office. Evening is free to visit the longest beach in India, Marina. Overnight at hotel. Drive to Mahabalipuram (60 Km/1½ hrs.). s is a sleepy coastal town further 60 km south of Chennai famed for its fascinating collection of exquisite rock cut temples and bas relief carvings. Though every sculpture and carving in this boulder strewn landscape is an exemplary specimen for Hindu temples, but the standout structure here at this world heritage site is the Shore Temple, a fist of rock-cuts symbolizing the heights zenith of Pallava architecture. During the 6th century, this was the port city of the during the Pallava rule. Even during Tsunami 2004, the rock cuts survived. Upon arrival here check-in to the hotel. Rest of the day is dedicated to the exploration of Mahabalipuram heritage temples. Overnight at hotel. 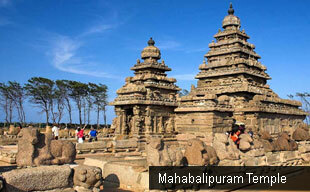 In the morning, check out Mahabalipuram for a drive to Pondicherry (95-Km / 02 hrs.). Pondicherry is a former classic French colony fused with seasoned south Indian traditions and lifestyle. Presently a union territory, Pondicherry or Puducherry is a beautiful seaside town with traces of intact French culture. Apart from the charming beach atmosphere, it's the presence of Sri Aurobindo Ashram that attracts most of the tourists to this town. The ashram, established by Sri Aurobindo in the year 1926 is the landmark attraction of visiting Pondicherry. Upon arrival here, check-in the hotel. In the noon, take a half day Pondicherry tour including a visit to the Sri Aurobindo Ashram. The Ashram retreat is not a quiet place but an important tourist attraction of the destination. Evening at leisure. Overnight at hotel. In the morning, check out Pondicherry for drive to Trichy (255 Km / 05 hrs.) Enroute stopover at Tanjore; a prominent Chola headquarter from 850-1270 period. The city is also a home to Carnatic music, musical instruments, dance, traditional handicrafts and Tanjore paintings. The city is famous for the Brihadeeswara Temple, the greatest of the temples built by Cholas and undoubtedly the finest contribution to the Dravidian temple architecture. Listed as a World Heritage site, this temple is a part of the great living Chola temples and is worshipped by thousands of devotees’ everyday. Later continue drive to Trichy. Upon arrival here, check-in to the hotel for overnight stay. Trichy or Tiruchirapalli is renowned for its great wealth of temples. One of the oldest cities of the region, the city hosts a fantastic range of temples. The first two temples of Trichy are located in the Rockfort temple complex. Located on an 84 m high rock, this is the eighteenth century fort complex enshrining cave-shrines and temples. The attraction here to look out for includes the Hall of a Thousand Pillars and the shrine of Shiva and Ganesha. On the top of the fort, enjoy the panoramic views of Trichy. Next stop is this temple city is the illustrious shrine of Ranganathaswamy Temple. Dedicated to the Hindu god Vishnu, this temple was known as a sacred seat of learning since 11th century. As old as two thousand years, this classic temple complex hosts a series of walled courts with 21 towers the tallest of which reaches up 72 meters. Afternoon is at leisure. Overnight at hotel. In the morning, check out Trichy for Madurai (200-Km/05 hrs). Madurai or the “city of honey nectar” nestles near the southern tip of India. One of the oldest cities in the world, this is known for its immaculate wealth of towering 12 Gopuram gateways. 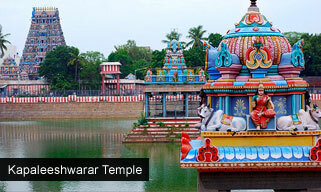 Located on the banks of Vaigai River, this temple city is the star attraction of the South India Temple Tour. 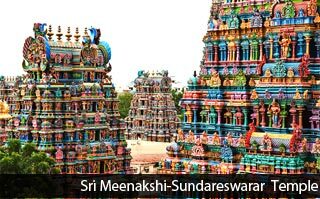 Dedicated to Goddess Meenakshi and Lord Sundareshwar, this religious shrine forms the lifeline of the city. Even after thousands of years, the temple forms the nerve of this city, illustrating the authentic Dravidian traditions and architecture in southern India. Upon arrival here, check-in to the hotel. Rest of the day at leisure. Overnight at hotel. Visit the great Meenakshi Temple in the early morning, one of the best times to visit this shrine. This temple is the pinnacle of South Indian temples. Spread over 6 hectares of area, the present temple structure was designed in 1560 by Vishwanatha Nayak and was later modified during the reign of Tirumalai Nayak. Also visit the Alagar Hills and Tirupara Kundran Rock temple. In the evening, again visit the spectacular Meenakshi Temple and witness the evening worship ritual. Overnight at hotel. In the morning, board the connecting flight from Madurai airport for the onward destination.